Samsung is on the way to add another color option to the range of its flagship smartphone. The new color is brown and it was spotted in the company's latest promo video of the Galaxy S4. At the official Galaxy S4 press event, Samsung announced it'll launch in two colors - Black Mist and White Frost. Later, a blue version of the smartphone was spotted in Japan. Just like it, the brown color variation of the Samsung Galaxy S4 isn't yet official, but it will probably debut pretty soon. 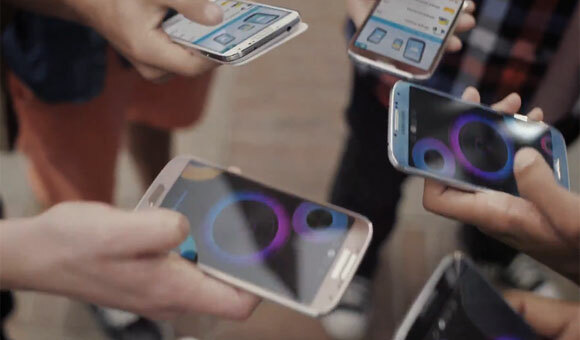 Here's the promo video in question if you'd like to catch a glimpse of the brown Galaxy S4 (it's at 1:18 minutes). Honestly, brown is the best color. I own the S3 Brown. As soon as the S4 launches in that color, I'm upgrading. It seems there are more colors in the image above, light blue, red, somewhat Purple & brown?? ?